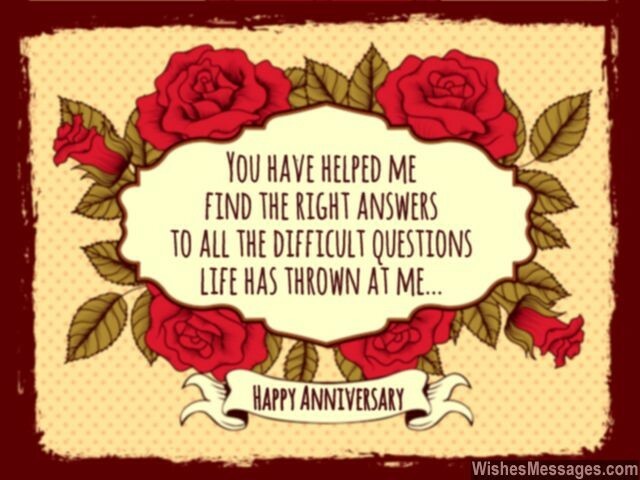 Anniversary Wishes for Wife: For one day, forget all your life’s problems and behave like two teenagers, madly craving for each others’ hugs. Trade flirty texts and cute quotes. Pin mushy stuff on Pinterest. Post funny banter and sweet nothings on each others’ Facebook. Exchange I Love You notes and greeting cards that ooze romance. Marriages may be made in heaven but husbands and wives live on earth. Unfortunately, the reality of life isn’t as rozy as movies make them out to be. Responsibilities of family, work, children and paying the bills often take away the sweetness from everyday life. Wedding anniversaries are a chance to rekindle your wedding’s romantic bond. Drop the kids off at grandma’s and take your wife out on a date to celebrate. Spoil her with a nice gift and make her feel like a beautiful princess. Seal it all off with a kiss, while you look in her eyes and wish her a Happy Anniversary. It will remind her that despite all the ups and downs, she is married to the guy who will do all it takes to keep her happy. 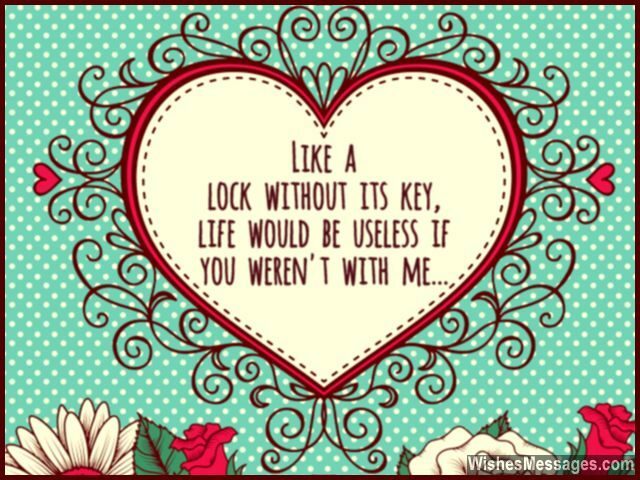 1) Like a lock without its key, life would be useless if you weren’t with me. Happy anniversary. 2) #happiness, #love and #romance are the only things trending permanently in our married lives. Happy anniversary. 3) Our house would never have become a home without you. Our kids would never have understood the meaning of family without you. I would have never experienced love without you. Happy anniversary. 4) It doesn’t matter whether we always agree or disagree. What matters is that I love you and you love me. Happy anniversary. 5) A Beautiful rose for a Beautiful woman who is my Beautiful wife and has given me a Beautiful life. Happy anniversary. 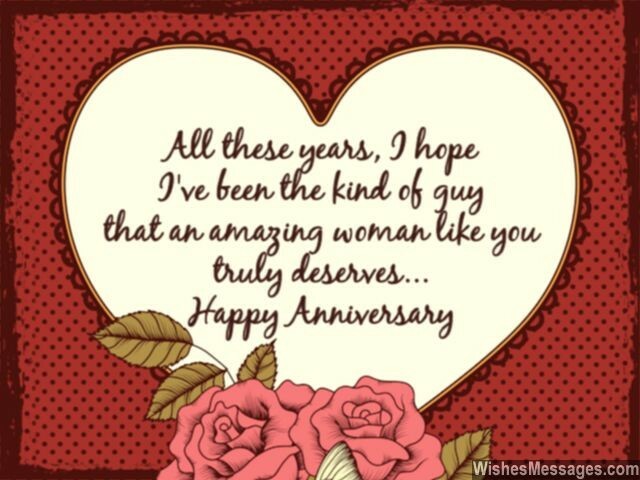 6) All these years, I hope I have been the kind of guy that an amazing woman like you truly deserves. Happy anniversary sweetheart. 7) I don’t know where I would be, if you hadn’t supported me. A dead end is where my life would come to, if it weren’t for you. Today, as we celebrate our anniversary, I just want to say thanks for everything baby. 8) Time has stopped ever since the day we got married. I’m stuck in a warp of sunny hues, smiles and everlasting love. Happy anniversary. 9) Rewinding and going back to the happy memories of our married lives, inspires me to fast forward and dream about the amazing future that lies ahead. Happy anniversary. 10) When I proposed to you, I gave you a ring. When you said Yes, you gave my life wings. Happy anniversary. 11) All my dreams, are about making yours come true. Happy anniversary. 12) Life can’t get any better – I tend to overuse this phrase because my life keeps getting better with every passing day and the reason for that is YOU. Happy anniversary. 13) Even though we have been married just for a few years, you can read my mind as if you have known me for a lifetime. Happy anniversary, I love you. 14) Let me hold you tight, with all my might. Let’s celebrate the day that we wed, and think of the good times that lie ahead. Happy anniversary. 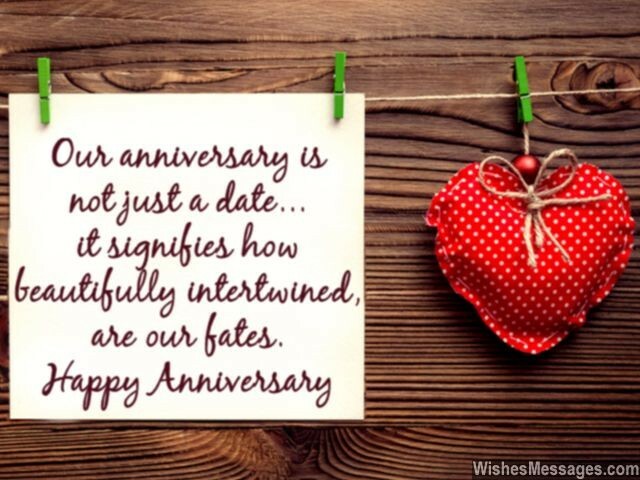 15) It doesn’t matter whether it is our first, fifth, tenth or fifteenth marriage anniversary. What matters is that I will always love you and you will always love me. Happy anniversary darling. 16) You have helped me find the right answers to all the difficult questions life has thrown at me. Happy anniversary. 17) This day is a reminder of the best decision of my life – to propose to, and get married to the world’s most beautiful woman. Happy anniversary. 18) Our anniversary is a celebration of the mistakes we made in the past, memories we are making today and all the happiness that is in store for us in the future. Happy anniversary. 20) Happy anniversary… to the reason for my happiness, the reason for my success, the reason for all my smiles, the reason our marriage has lasted many a mile. I love you. 22) Although this anniversary is a small step in our life’s journey, it is a beautiful moment which is a part of our love’s destiny. Happy anniversary. 23) If a genie came to me and granted me a few wishes, it would be a complete waste. Because with you by my side, I already have everything I could ever ask for. Happy anniversary. 24) We’ve come a long way since we met each other for the first time. Happy moments, sad times, nasty fights and crazy misunderstandings – we’ve been through it all. I have no regrets and even if I had the chance of doing it all again, I’d do it the exact same way and with no one else but you. Happy anniversary. 25) It doesn’t take a rocket scientist to discover that a beautiful wife with a beautiful heart equals a beautiful life. Happy anniversary. 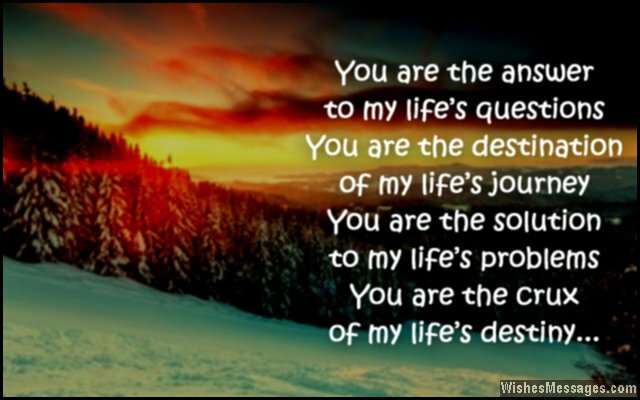 26) You are the answer to my life’s questions, you are the destination of my life’s journey. You are the solution to my life’s problems, you are the crux of my life’s destiny. Happy anniversary. 27) All these years of marriage have been like a beautiful long dream. without an annoying alarm clock to wake me up. Happy anniversary. 28) For me the glass is always half full and for you, it is always half empty. But this exactly what makes us perfectly complementary. Happy anniversary. 29) In times of happiness or trouble, whether I find gold or rubble, I know that you will always stand by me… and never burst our happy bubble. Happy anniversary. 30) You are the kind of wife who puts self-help books about marriage and compatibility to shame. Happy anniversary. 31) I think I am blind to all of life’s problems because you have opened my eyes to all of life’s beauty. Happy anniversary. 32) Every day when we fight and argue, I may have a thousand reasons to be angry at you… but I want you to remember that I have a million reasons to love you too. Happy anniversary. 33) You are the Good in my Good Morning, Happy in my Happy Birthday and Love in my I Love You. Happy anniversary to the woman who is the essence of my life. 34) The gift that I got for you on our anniversary, is insignificant in front of how you have given me a meaningful life and a loving family. I love you. 35) I want our anniversary celebration to be grand because you make our lives grand every single day. Happy anniversary. 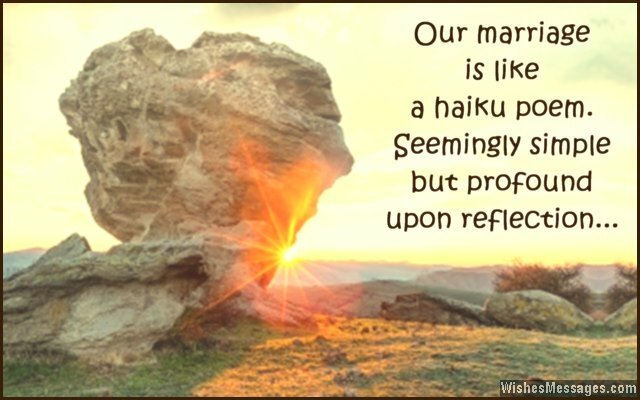 36) Our marriage is like a haiku poem – seemingly simple but profound upon reflection. Happy anniversary. 37) Some husbands dedicate songs, some dedicate a Facebook page and some dedicate gifts to their wives on a wedding anniversary. I have kept it simple and dedicated my whole life to you, sweetheart. Happy anniversary. 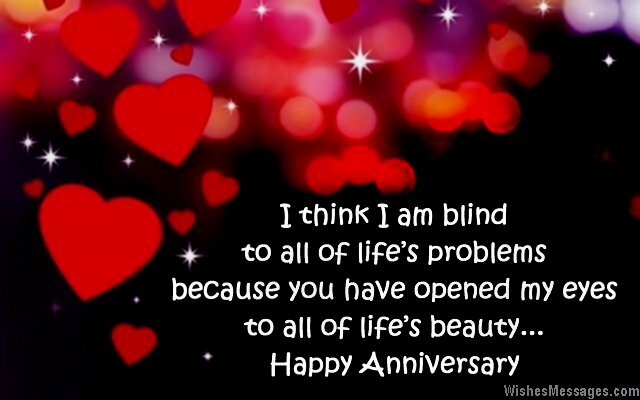 38) Nothing can stop our anniversary from being happy, as long as I am your hubby and you are my wifey. I love you. 39) In the daily humdrum of life, sometimes I take you for granted. Today is the perfect moment to say Thank You for all the sacrifices you’ve made to keep the boat of our lives afloat. Happy anniversary. 40) I don’t know how others celebrate their wedding anniversaries but I’m going to celebrate ours by doing what I like doing the most – pampering my princess. Happy anniversary.